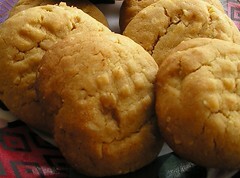 Peanut butter cookies - Do You Know The Muffin Man? Notes: Made from dough frozen back in April. Must watch the cookies as they burn very easily (a box grater is an easy way to scrape off burnt bottoms). The way to get soft chewy cookies is to ensure they aren't overbaked. Used Adams Natural Peanut Butter, great roasted flavour.